Hastings United’s footballers were beaten at home to a table-topping Tooting & Mitcham United side which played the majority of this afternoon’s (Saturday’s) game with 10 men. 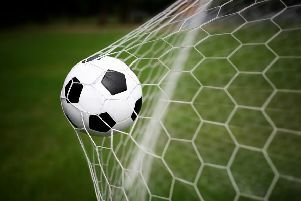 United failed to score for the first time all season as they lost 1-0 against Ryman Football League Division One South leaders Tooting, who had their left-back sent-off in the first half. The result also ended United’s 10-match unbeaten run and they dropped a place to sixth in the table - one position and one point outside the play-off spots. United’s second highest crowd of the season turned out on a lovely spring afternoon and they were probably expecting a feast of goals between the two highest scoring teams in the top eight tiers of English football. But although the sides had netted 217 league goals between them this term prior to kick-off, chances were in short supply at either end during a match which failed to live up to its billing. The opening 20 minutes were tight and keenly contested. United wide player Matt Bodkin drove a cross-shot wide of the far post in a rare sight of goal. Tooting then seemed to be getting on top, albeit without giving United goalkeeper Lenny Pidgeley a great deal to worry about. Jordan Wilson saw an angled shot blocked after tricking his way past two United defenders and Ollie Rowe got in the way of Billy Dunn’s follow-up. The big moment of the first half came in the 35th minute. Peter Wedgeworth was shown a straight red card for a reckless challenge from behind on Frannie Collin right in front of the home dugout. That presented United with what seemed a real window of opportunity, but they failed to make their numerical advantage count and, in fact, you wouldn’t really have known they had an extra player as they rarely troubled a solid Tooting outfit. Shortly before the hour mark, United substitute Charlie Harris shot just off target from 25 yards and moments later a deflected Jack Evans volley from similar range went narrowly wide. Tooting broke from the resulting United corner and the hosts were grateful to a vital Simon Johnson interception inside their own box. Jordan Wilson’s 25-yard free kick was pushed away by Pidgeley diving to his right - the only genuine save made by either goalkeeper all afternoon. If either side was going to break the stalemate, Tooting seemed the more likely and they grabbed their 13th consecutive victory with a superb solo goal in the 75th minute. Tenny Adebowale - who came on as a substitute shortly after the red card - intercepted a United pass well inside his own half and surged forward before curling a lovely left-foot shot beyond Pidgeley from 25 yards. United brought on two attacking players for defenders during the second half and one of them, new loan signing Shomari Barnwell, headed wide at the far post from a Harris corner. Though United were uncharacteristically short of attacking threat, they were desperately unlucky not to equalise in the first minute of added time. Johnson rattled the crossbar with a terrific volley from Barnwell’s headed knock-down and seconds later in the same attack, Collin’s header also struck the crossbar with the rebound falling just out of reach. United: Pidgeley, Butcher (Hughes-Mason 84), Cruttwell, Evans, Sobers (Barnwell 64), Rowe, Bodkin, Johnson, Stevenson (Harris 54), Collin, Stannard. Subs not used: Emptage, Nicholls. Attendance: 645. Ryman Division One South top 10 (played-points): 1 Tooting & Mitcham United 39-92 (+63 goal difference), 2 Dorking Wanderers 38-83 (+48), 3 Greenwich Borough 38-75 (+34), 4 Corinthian-Casuals 38-72 (+22), 5 Carshalton Athletic 39-68 (+29), 6 HASTINGS UNITED 38-67 (+53), 7 Hythe Town 38-67 (+23), 8 Lewes 38-67 (+9), 9 Faversham Town 39-60 (+23), 10 Walton Casuals 39-60 (+5).